Santiago del Estero has an estimated population of 20 million eared doves constantly increasing, offering today the same hunting quality Córdoba gave 15 years ago. The Eared Dove is almost identical to the North American Mourning Dove, being their main difference that the eared dove flies all day long, what ensures non-stop shooting. On a typical day any time of the year, an experienced hunter can shoot up to 2,000 rounds, mainly fly shoot. 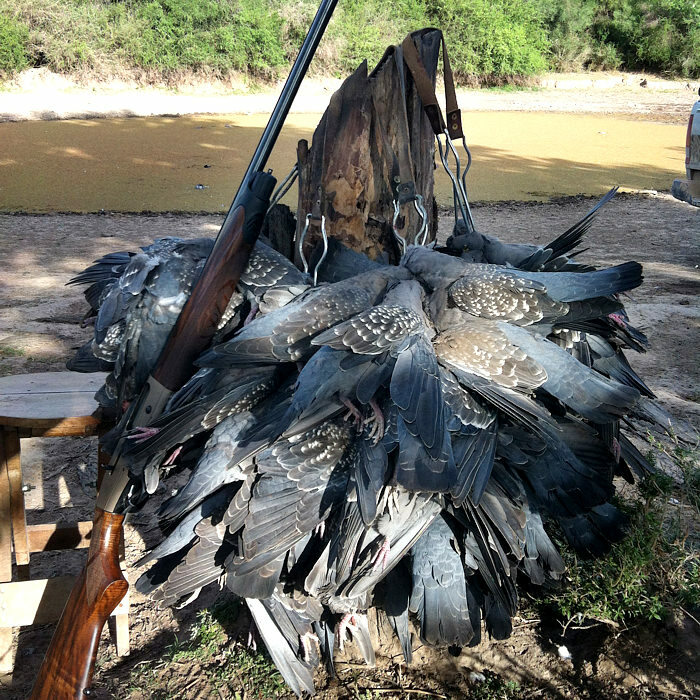 Argentine Blue-Grey and Pica Zuru are the species hunted in Santiago. They have a wing-span of over 26 inches, longer than a Blue Wing Teal. This shooting is over grain fields and the allowed use of decoys makes it effective and successful in all seasons, especially spring and fall. «Charatas» are native birds, similar to pheasants in size, and clever as turkeys. They inhabit open groves of trees and move in flocks, communicating with each other through complex sounds. They move quickly among the trees and on the ground. Hunters can either shoot them from blinds, or walk into the grove looking for them. Bird boys will help learn about the bird habits and find them. Wingshooting unlimited is the only outfitter offering this hunting in the region. It takes place in a swampy area located at less than ninety minutes from the lodge, where about 12 different species inhabit. There’s a great variety of teals, which increase or decrease according to water level and weather conditions. Once at the hunting spot, hunters are taken by boat to the other side of the river and set in the blinds before dawn. 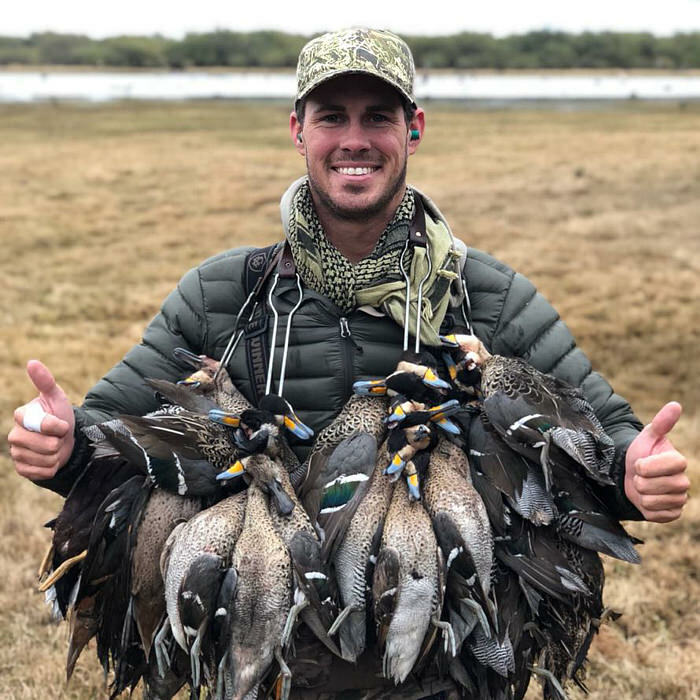 Due to the surroundings and hunting conditions, this is a very exciting experience, highly enjoyable by shooters, with a bag limit of 25 ducks per hunter per day. A few if any outfitter can offer such a combination of bird species just out of one lodge, in a 30 mile area: dove, pigeon, “charata”, duck and “perdiz” converging in a real bird sanctuary all along the year. From the finest “perdiz” caught over breed trained pointing dogs to the unusual “charata” offered in a similar hunt to the traditional turkey hunting in the United States, with a bag limit of 10 per hunter per day. 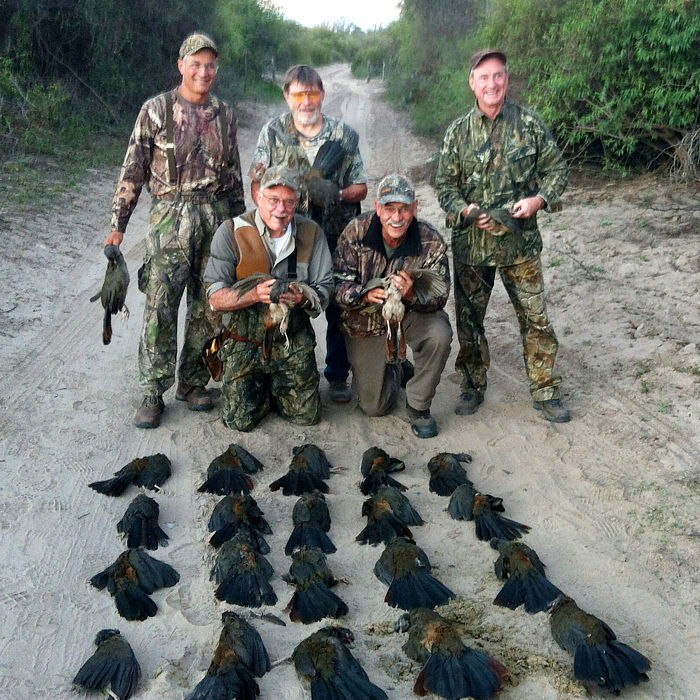 Perdiz and duck hunting season in Argentina runs from May 1st to August 5th every year, while there’s non-stop high-volume dove hunting all year round. 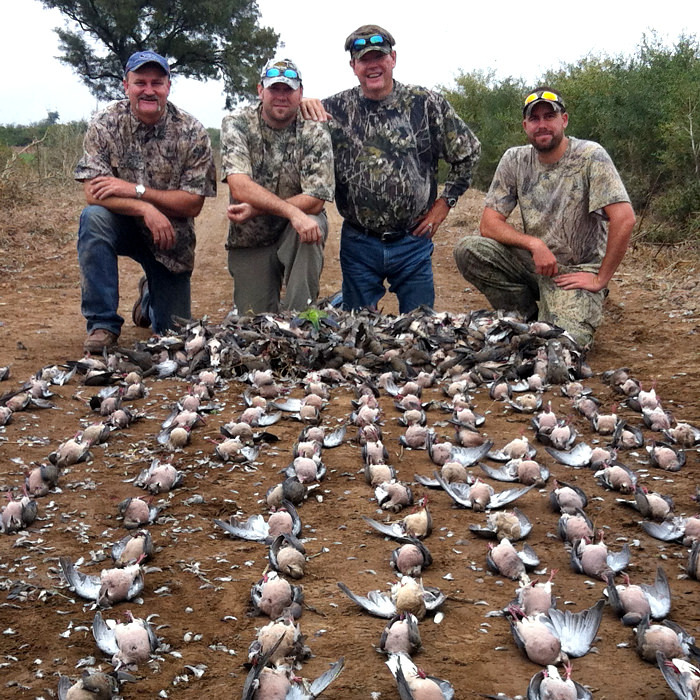 There are legal daily restrictions on duck, perdiz and pigeon, while there is no limit on dove hunt. We offer an optional gun rental service, providing our hunters with semiautomatic Beretta, Urika 391, gauge 20 (other gauges available upon request). In the case the hunter chooses to bring his own shotgun, we’ll provide the official gun entry form and advise on tax to pay and the steps to follow in order to make the procedure easier. All hunters, including those under 16 years of age, must purchase a wingshooting license. The hunter’s full name and passport number will be required beforehand for gun rental and hunting license paperwork.